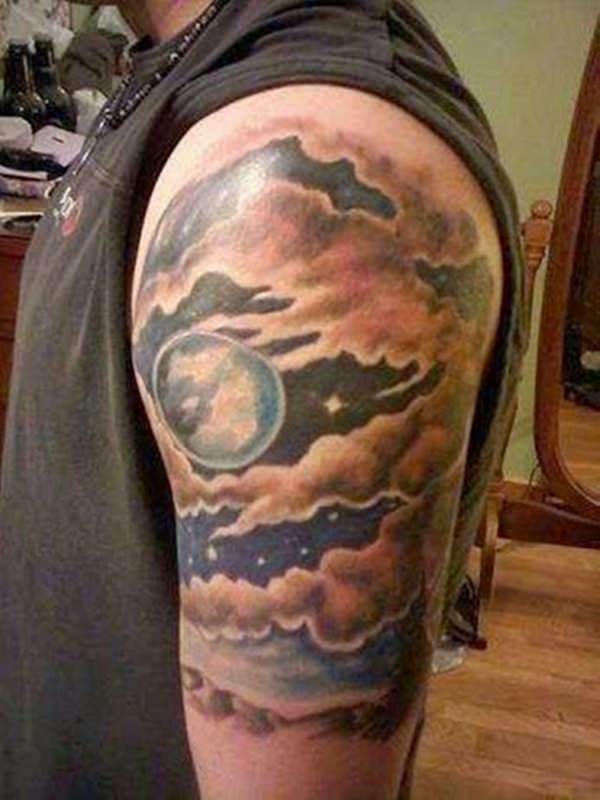 Cloud tattoos are often used as symbols of transcendence, heavenly intervention, inspiration, and fantastical imaginings (like a boy sitting on the moon amongst the clouds). They can be used to surround a variety of other tattoos fluidly, helping to weave together designs throughout the body. Stars can be used amongst them, as well as the sun or any other astrological theme. 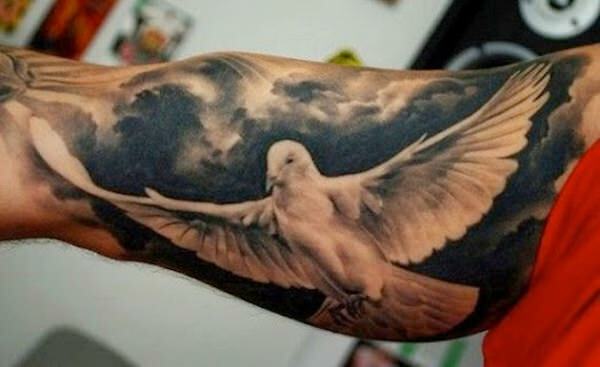 They can be divinely serene or wickedly menacing – the choice is yours when it comes to cloud tattoos. 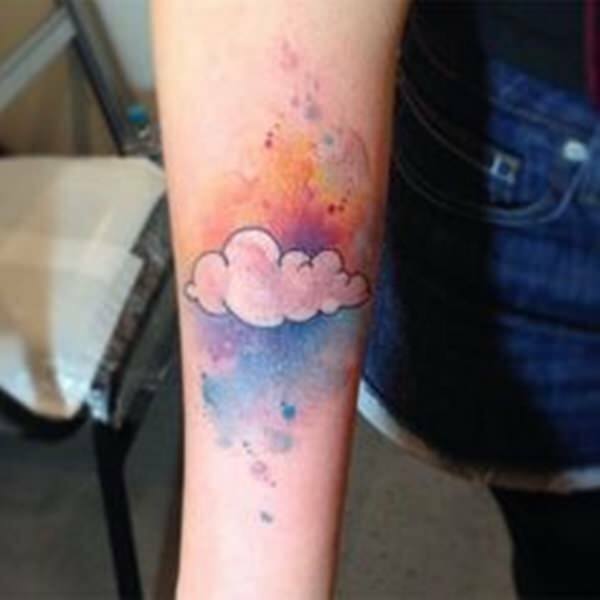 If you’re considering getting a cloud tattoo, take a look at these 40 we’ve compiled here on Zarias to help inspire your personal design. This swirling design amongst the fingers is outstanding work done by an outstanding artist. Here, the clouds look like they’re a swirling smoke, rising to the skies as if summoning a deity. 2. Rising or Lowering Mist? 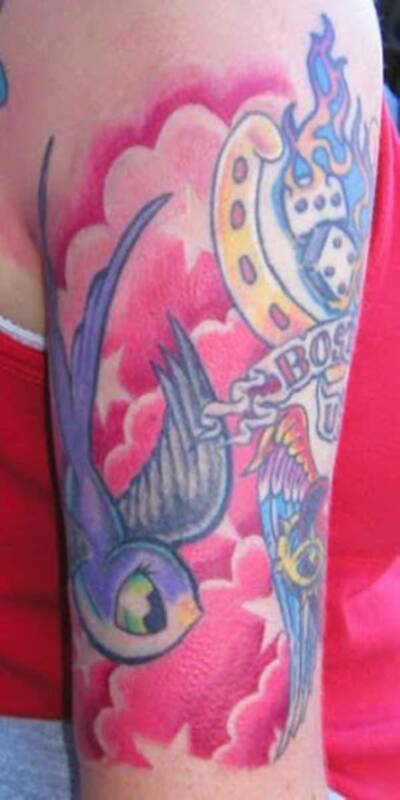 There’s a contrast between the red and blue in the clouds and/or smoke seen on this tattoo. It looks out-of-this-world abstract with enough detail yet to show what looks to be a tree and moon. These swirling clouds come together with one idea in mind: a contribution to a special someone that’s risen to heaven and is amongst the stars. Often, light shining through the clouds (either from the sun or from heaven) is also coupled with a piece of art dedicated to someone who’s passed as seen above. This eye could be looking directly into your soul. The lines are thick and intense; the shadows dominate this piece of art. It’s simple but harbors a deep meaning to the wearer. 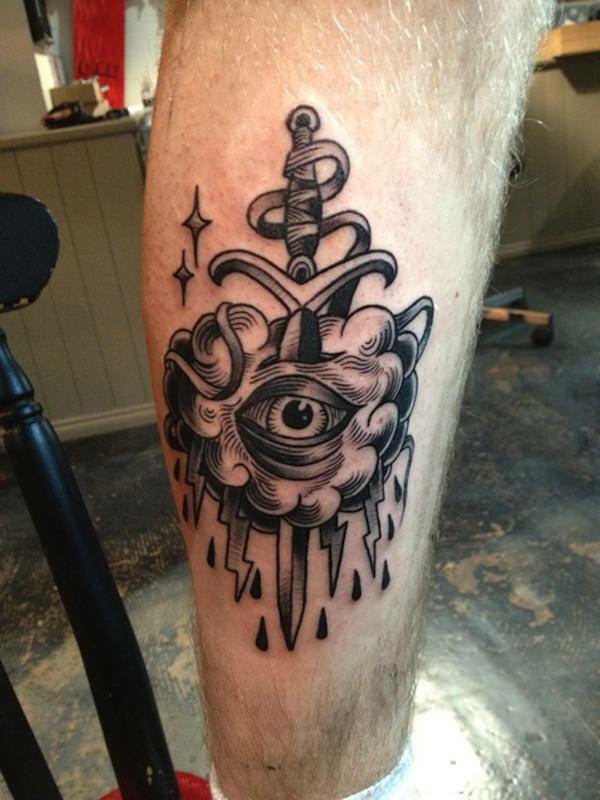 Rain, stars, clouds, and a vivid eye are always for an intriguing piece of work. Sometimes we can still see a few stars shining through the night time sky’s clouds, even on the darkest nights. 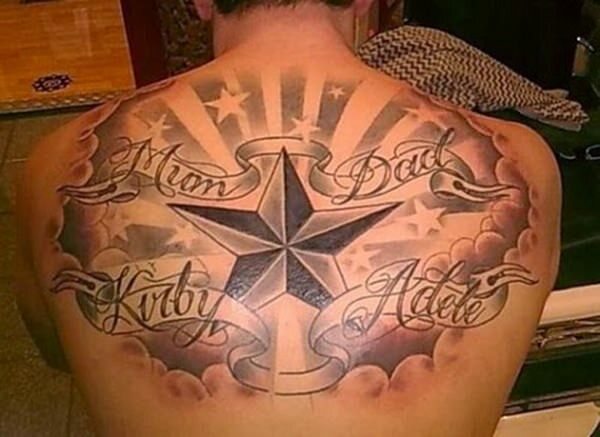 Yeah, we’ve all seen that type of star on one tattoo wearer or another – usually more than one since they’re quite popular. 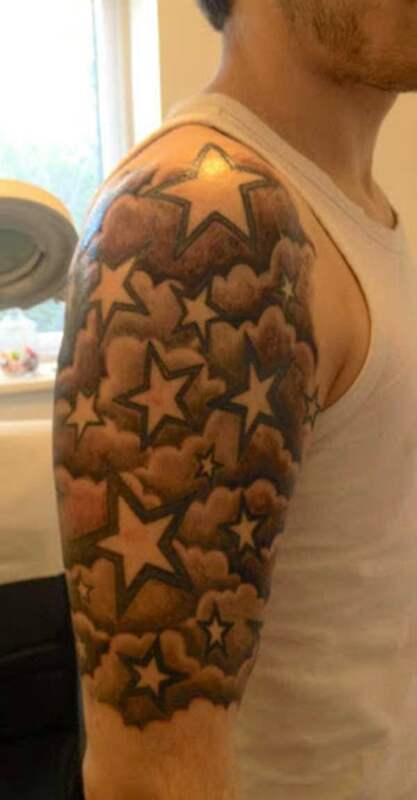 But adding some shaded clouds behind them is a nice touch, making these stars just a little more unique than others. 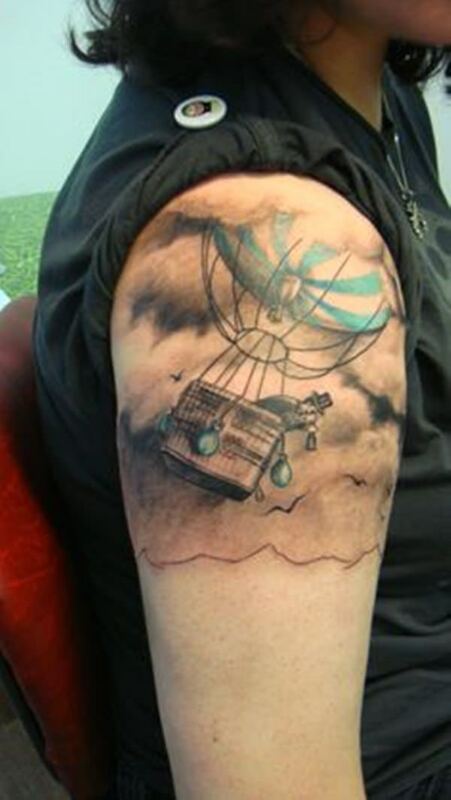 The clouds in this tat are clearly representing the transcendence of the balloon into the sky. 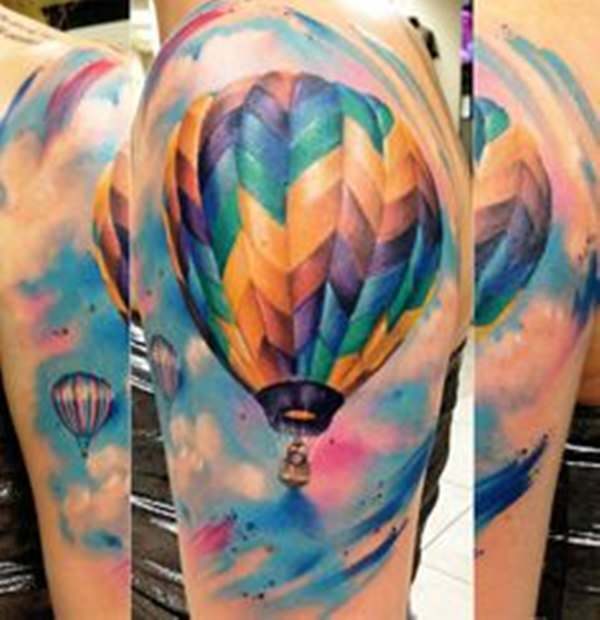 This tat can be considered to represent the free as well, those who are free in a free world thus the design on the balloon. Of course, the real meaning is known to the wearer. 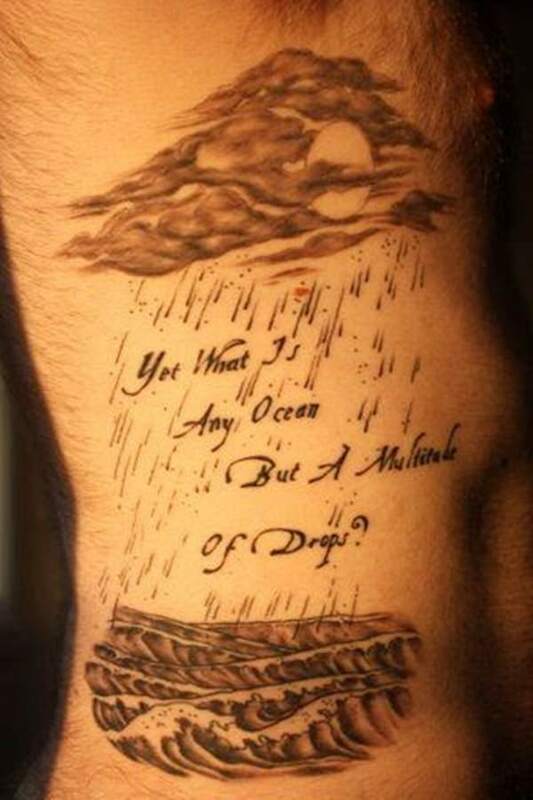 The quote “Yet what is any ocean but a multitude of drops?” is a wonderful way to look at things in the world. It reminds us that even the biggest things; the biggest obstacles are simply a multitude of smaller ones. Every step of the way is a push forward on the wondrous path of life. A girl staring at the big beautiful moon, sitting on a cliff overlooking the ocean and sky. 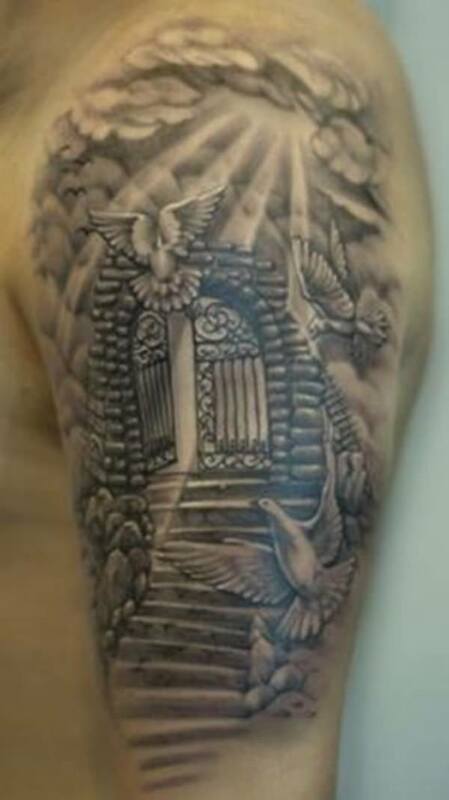 This is quite a detailed tattoo, holding true meaning to the wearer. 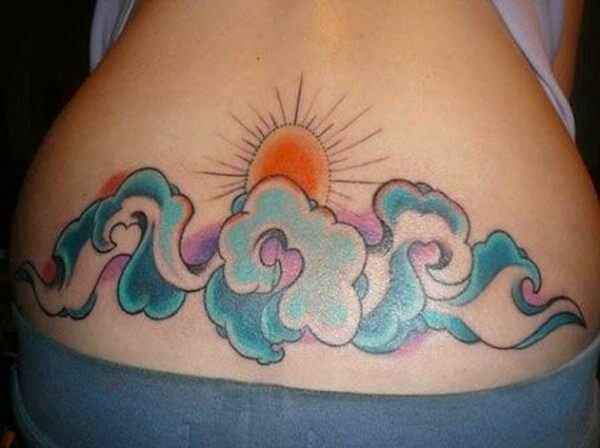 The clouds in this tattoo aren’t done in ink, but rather, the sky is – the clouds being the color of the wearer’s skin. Its a great technique to keep cloud tattoos looking lighter, like their true form. 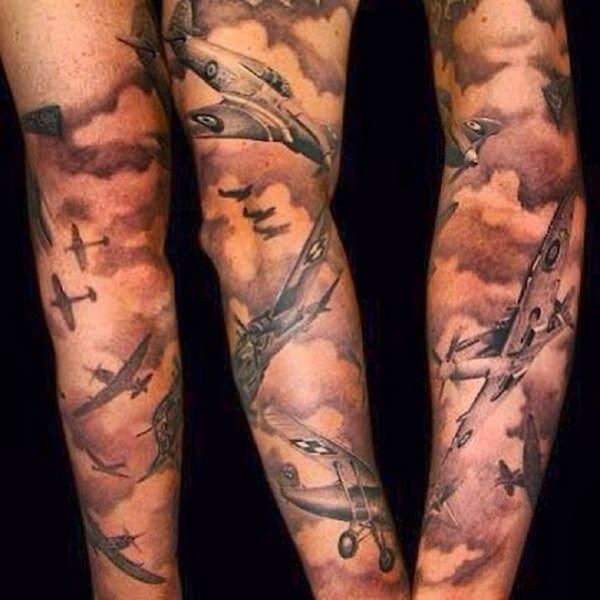 The cloud tattoos seen here are coupled with airplanes from previous world wars as a contribution to the veterans that served. Any great airplane tattoo needs great clouds to show just how high up in the sky they are. This free flying dove looks like its flying from dark and menacing clouds, the kind that forebode a horrible storm. Yet it’s flying in front of the storm, getting away just in time – it’s quite symbolic and can told a torrent of meaning for both the wearer and onlooker. The quote here is a wonderful reminder to live in the moment, and this wearer dedicated a large piece of skin towards having such a quote inked on her. 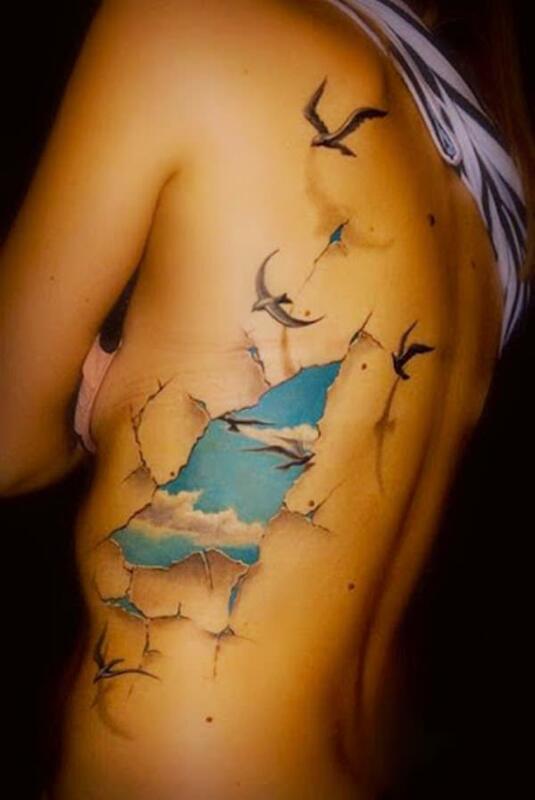 These lovely cloud tattoos are done in various shades of blue. If you decide to get shaded ink colors, ensure you’re not allergic to them beforehand and ensure your artist has legitimate materials to be inking properly. 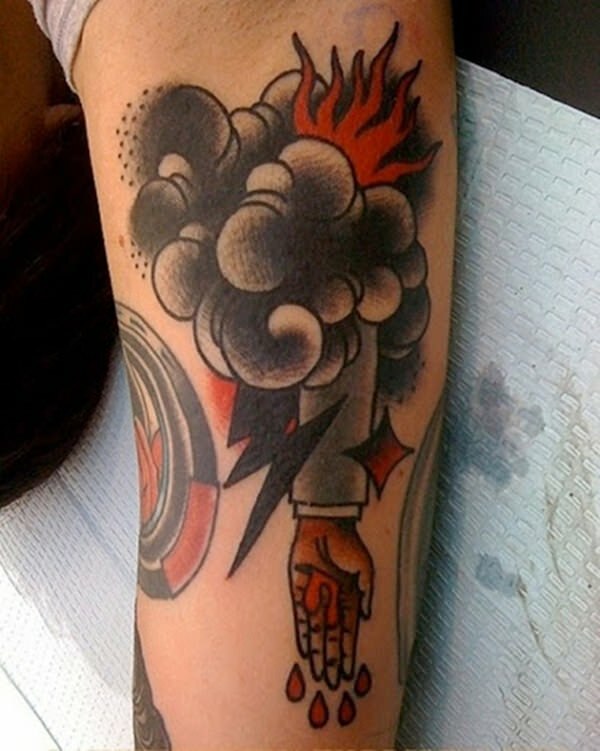 Simple cloud tattoos like this one are a great way to help expose a lightening bolt, which are also quite popular tattoos these days. 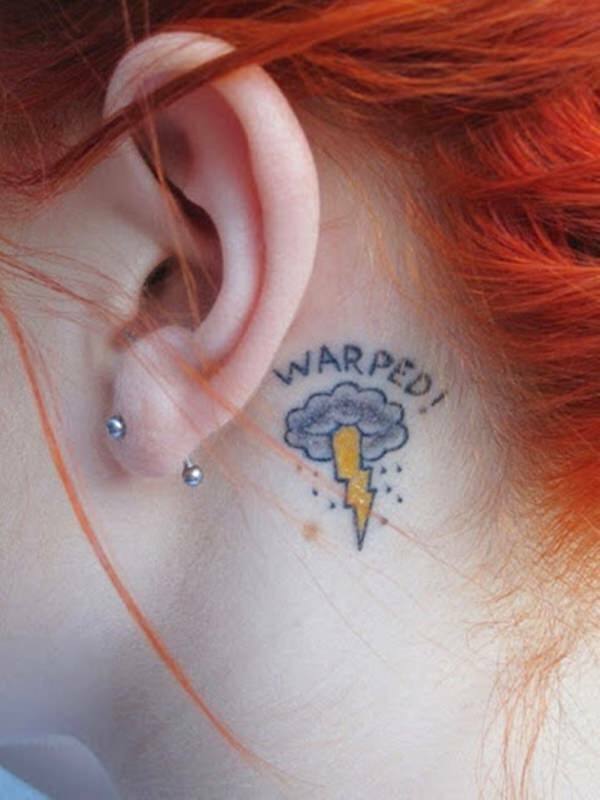 The fact that it’s behind the ear and includes a fun word like “warped” really says a lot about the wearer! 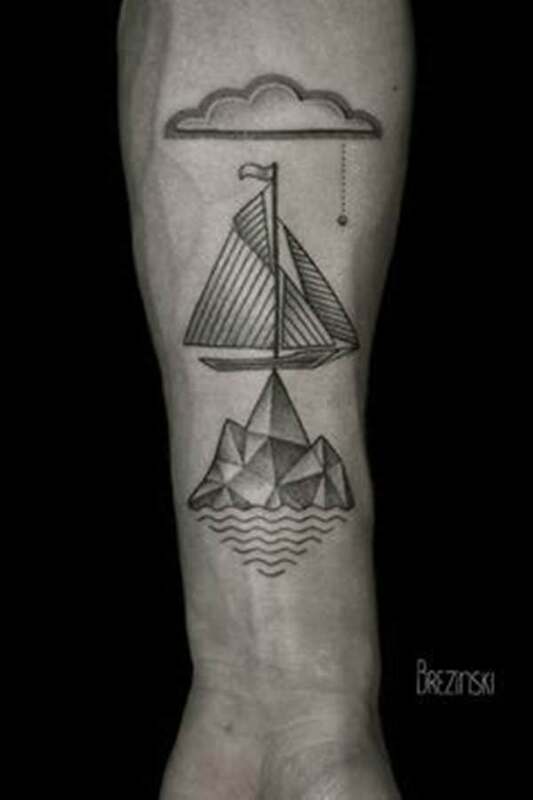 This tattoo is breathtaking. It makes the skin look as if it’s been torn by free and fleeting birds, escaping the realm within and finding freedom from the deep shell of society’s walls. 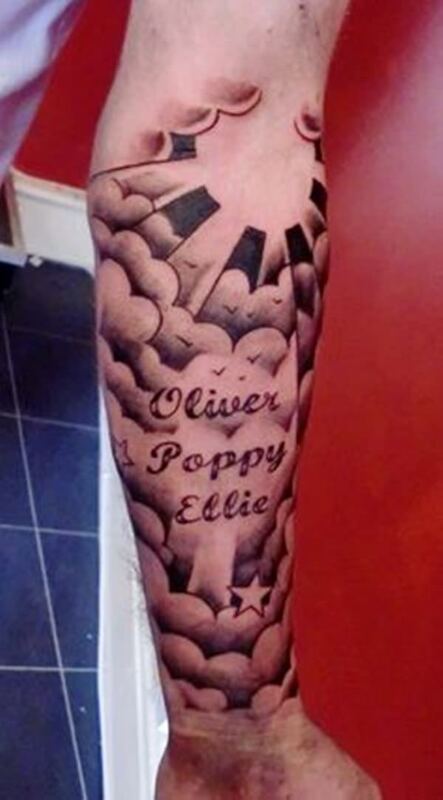 Of course, this tattoo could mean something completely different to you and the wearer. It just looks fabulously done, the edges perfectly like broken or torn artwork. These clouds look like the remnants of this wearer’s brain – creating a “brain storm”! Very symbolic, colorful, and intriguing to look at. 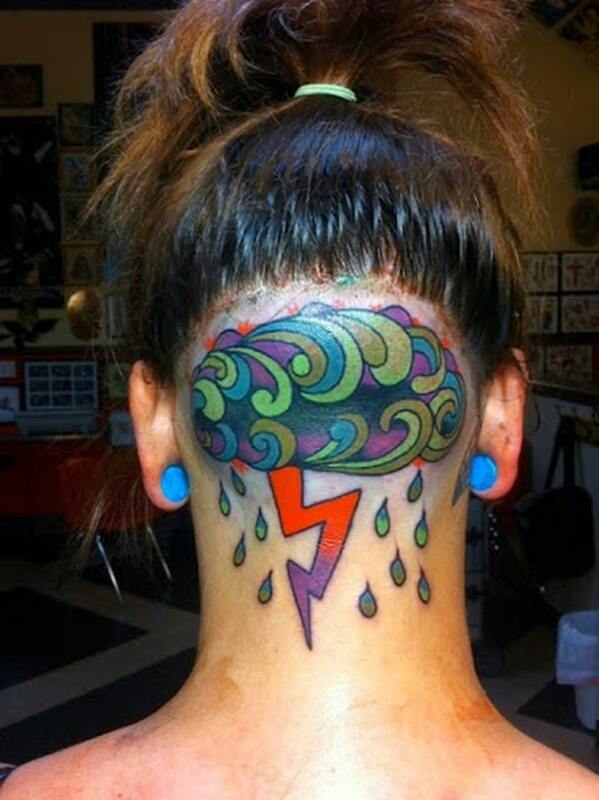 Not all cloud tattoos are done in simple black and white or even blue. 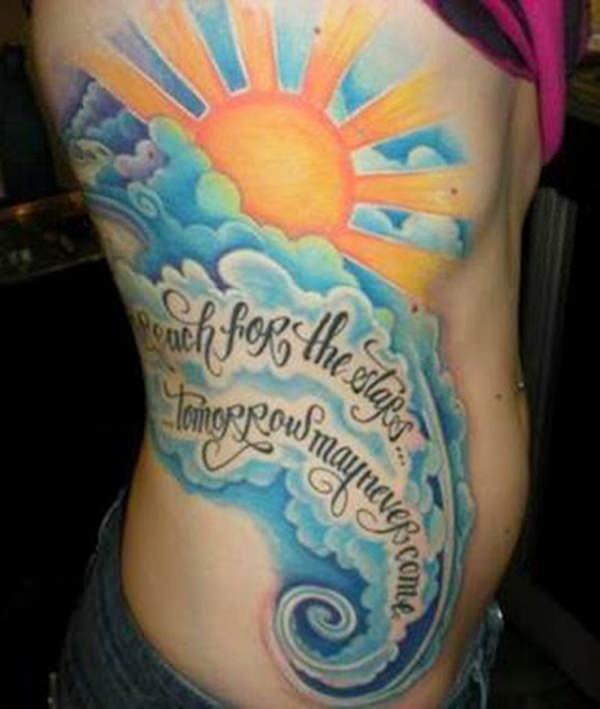 You can add the colors of a sunset to your cloud tattoos and get something like what’s seen above. 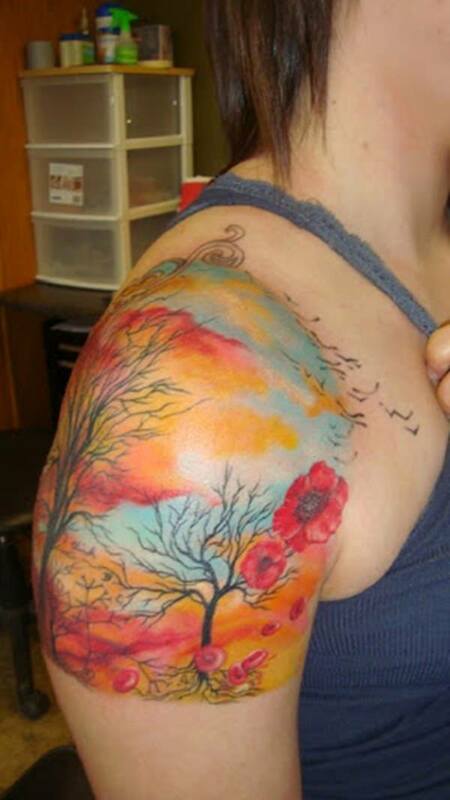 Combine with the silhouette of trees and voila, a gorgeous piece of inked artwork. These clouds are seemingly more earthly, combined with abstract waves and what could be a geometric ship. The sunset is inside the clouds instead of behind them. It’s always fun to create a piece of inked artwork that could pass as more than just one thing. Are these clouds or are these waves? This piece looks as if its a lovely combination of both, the sun setting either in the sky or on the horizon. 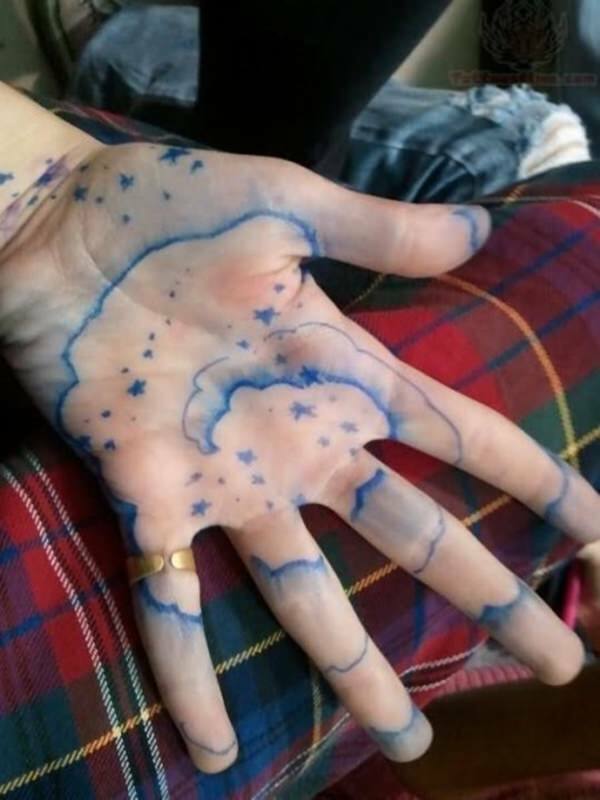 These cloud tattoos are amongst a gorgeous night sky and the moon, a cosmological display of fine art. These dark clouds surround the essence of a lightning bolt, quite a large and crazy one at that. This piece also seemingly shows the place where the lightening has come from. 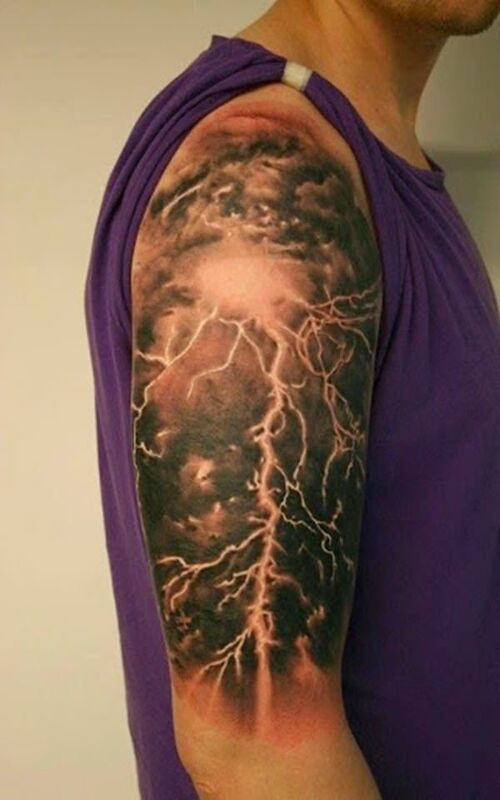 While storms are naturally amazing and beautiful, one wonders why this wearer has their entire arm dedicated to a large lightning bolt. 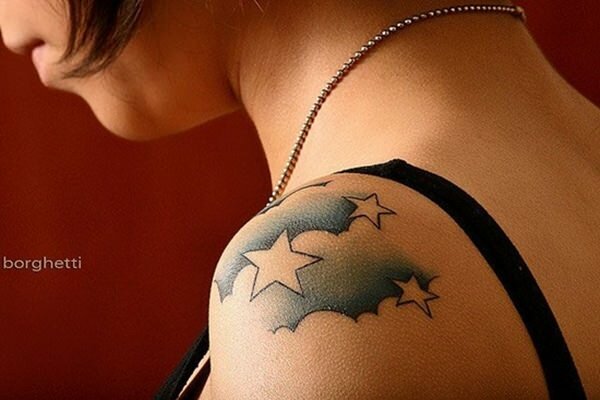 This dedication takes over the wearer’s entire back; clouds combined with stars and done with wonderful shading. 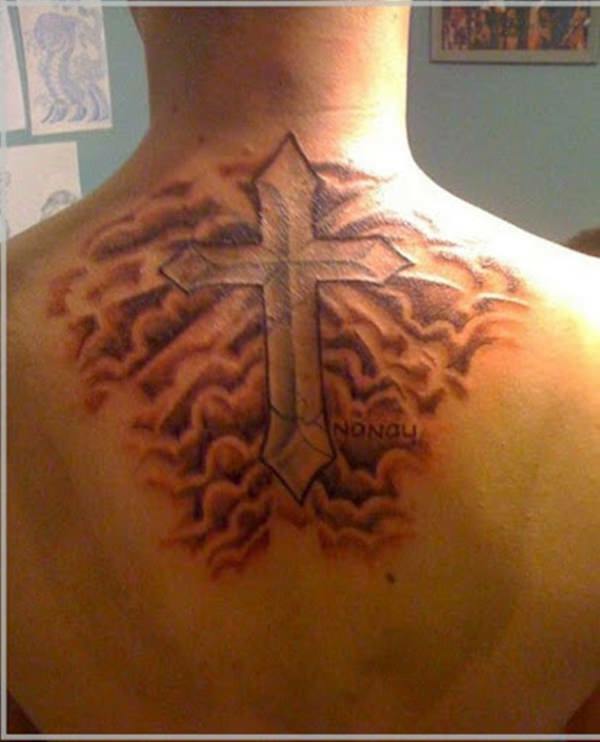 For the religious, this tattoo can hold a plethora of meaning, especially being biblically symbolic as the cross, representing Jesus, rises into the clouds. This umbrella harbors the storm instead of protecting you from it! What a fascinating idea, and quite dark if you’re to interpret it aside such a dark and menacing bird. 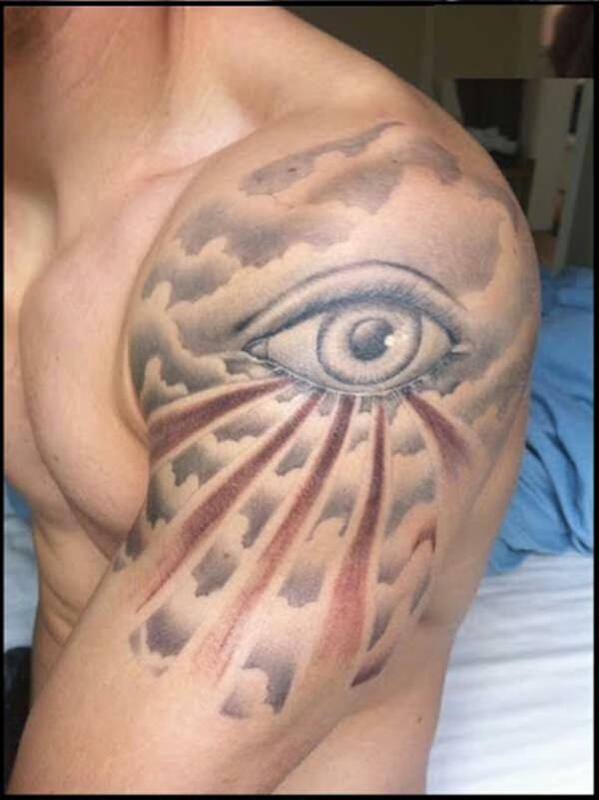 This all seeing eye spreads its rays amongst the clouds and onto the land below. Those clouds are done in perfect layers leading up to the eye, but they’re more random above it. Wonder if that was done on purpose. 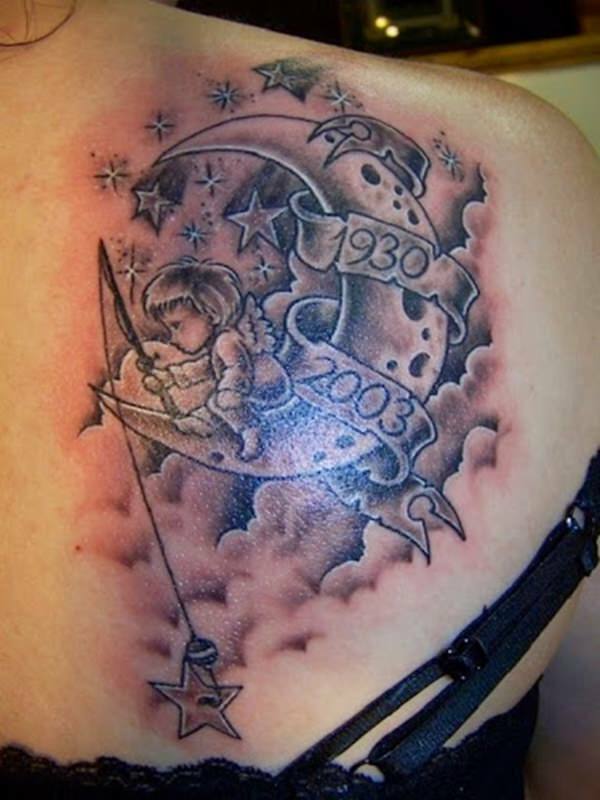 This tattoo is a contribution to a loved one, with dates denoting their lifespan. Whoever this is for must have enjoyed the image of a boy sitting atop a moon of cheese, fishing for wishing stars – a magical conception indeed. Here are smoky clouds, with creepy images coming out of them. Who wants a bleeding business arm and hand coming out of the clouds? This guy. 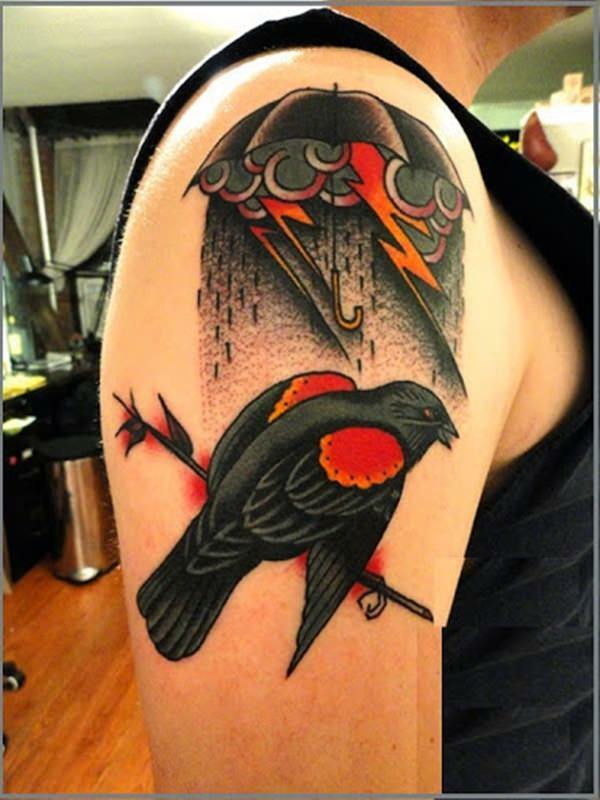 Normally, red cloud tattoos would be associated with a more menacing concept, but as we see here, there are colorful and happy looking birds amongst them! See the stars within the clouds, too? Are you familiar with Asian artwork depicting swirling clouds amongst jagged, tree-covered mountaintops? That’s what these clouds remind me of. A wonderful addition to coupling it with lovely flowers. These clouds look remarkable with the red bird silhouettes and black tree silhouettes. 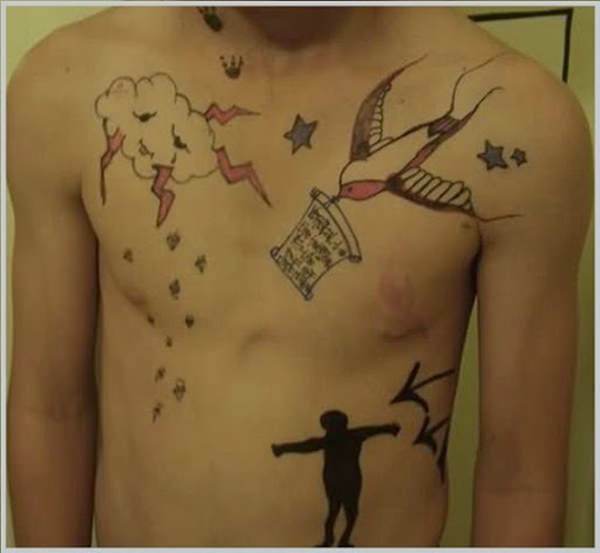 Without the cloud tattoos, this piece of artwork just wouldn’t look the same. 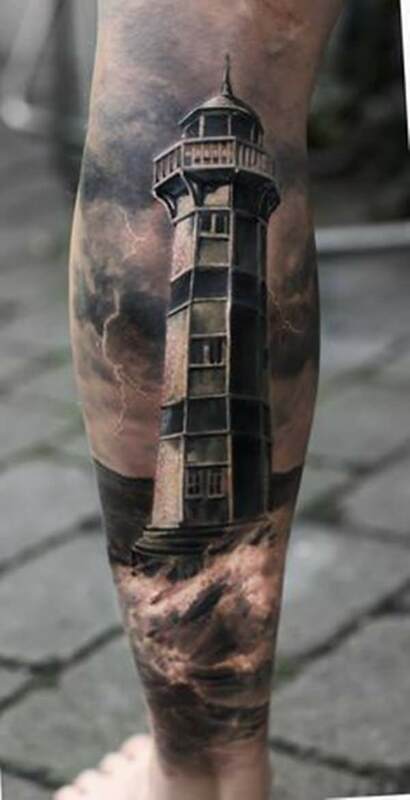 An angry ocean beating against the cliffs, dark and evil clouds lingering in the distance as lightning lights up the sky, and a lighthouse standing amidst it all guiding the unlucky sailors to safety. 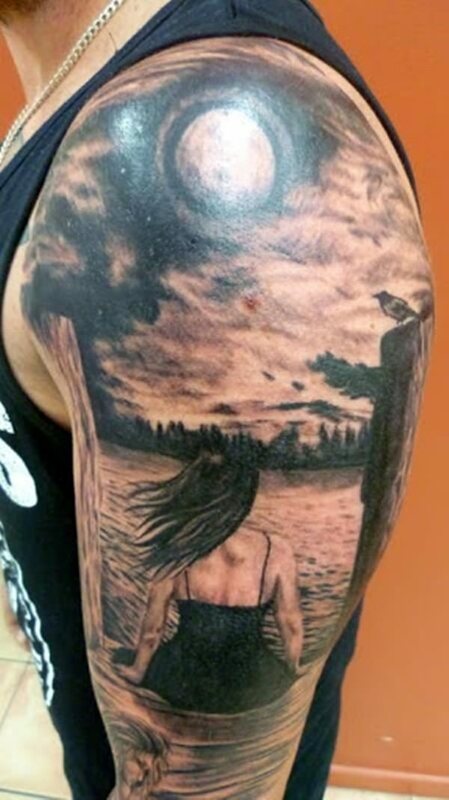 This tattoo that has intriguing clouds within the background truly tells a story. 33. What Can You See? 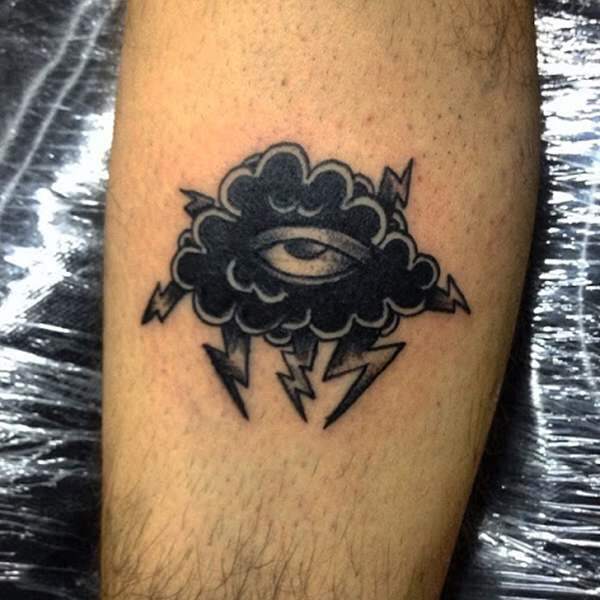 This is a simple cloud tattoo with simply lightning bolts and a simple eye, but it makes a not-so-simple statement that holds true and ancient meaning if you’re into interpreting and analyzing like that. 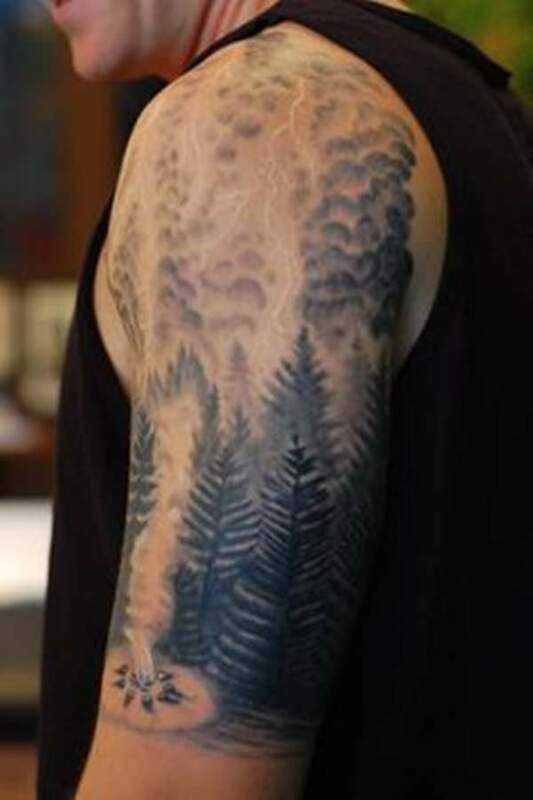 Not only does this cloud tattoo that’s among trees look bracingly earthly, it also looks more like smoke than the smoke that’s rising from the fire! No stairway to heaven is complete with a plethora of surrounding clouds. Cloudy days may cover up the sight of this “all-seeing” eye, but clouds do clear eventually. A white cloud among a colorful backdrop of sky – lovely and a fresh idea. These geometric lines are done quite well, and a fun tat to try and analyze. 40. Remind You of Anything? 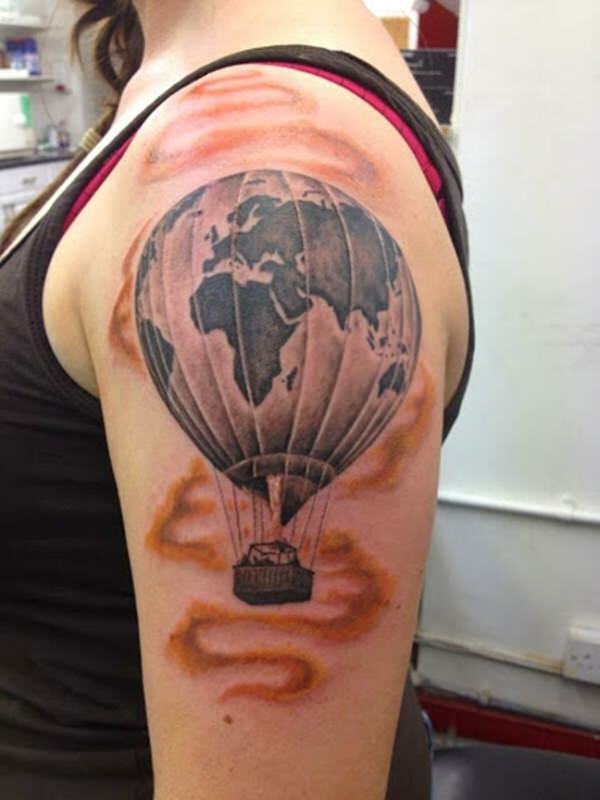 This cloud tattoo has a curious man in a balloon within it. Kind of like in the Wizard of Oz or The Great and Powerful Oz! 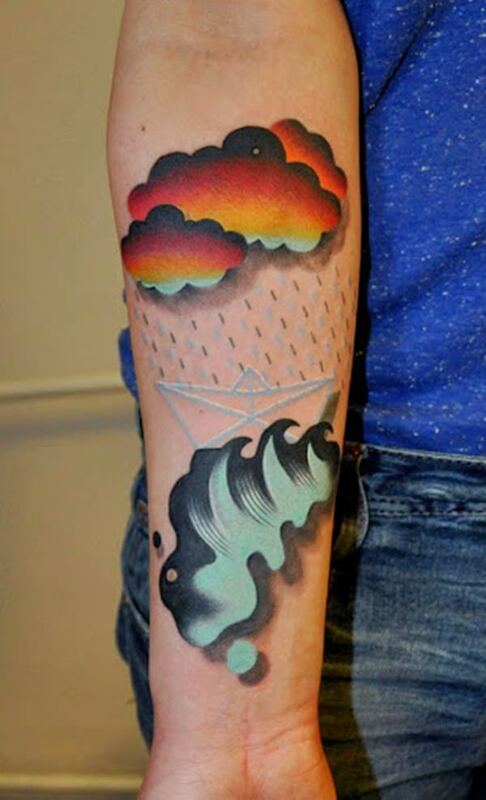 Thanks for viewing these cloud tattoos on Zarias – we hope they inspired your own inked artwork!